Schools are well on their way toward transforming how they use technology, whether it’s for student-parent interaction, enhanced lessons, mobile classrooms or student data management. In the last decade, new software, applications and devices have been introduced into school districts to encourage learning and support valuable resources. Last year, the Cambridge International Global Education Census discovered that 74% of U.S. K-12 students are now using smartphones as educational aids inside classrooms – in addition to tablets and laptops already in use in many schools. Lesson plans are accessible in the cloud, homework is submitted through online portals and standardized testing is being completed on connected computers. Georgia’s seventh-largest school district, Forsyth County Schools, is experiencing first-hand how technology is changing learning. Since 2001, the district’s student population has grown by 170%. Twenty-three additional schools have been built in the last two decades, bringing the district’s total to 39. Along with this growth also came more devices and technology. After seeing how quickly things were shifting, the district knew it needed to rework its school network to not only support the devices and learning styles of today, but also to plan ahead for future initiatives. Here we’re sharing three ways that Forsyth County Schools is redefining itself and its school network infrastructure to keep digital learning at the forefront. The school district believes that effective use of technology increases productivity, encourages learning leadership, expands access to resources and develops digital citizenship. To support forward-thinking technology initiatives, the Forsyth County Schools technology team consists of three units: Information Systems, Instructional Technology and Technology Services. Without a team dedicated to this initiative, much of the new technology implemented by the district in the last few years would not have been possible. In the past – like many schools – the Forsyth School District had only a handful of computers in each classroom, with strategically placed wireless access points that met the demands of a few laptops. Now, every student has a Chromebook and Internet access. On any given day, there are 86,000 devices accessing the school network. To provide more connectivity for students, teachers, and staff, dedicated wireless access points were needed in each classroom – which was a huge increase in the number of access points coming onto the school network. Forsyth County Schools Superintendent Dr. Jeff Bearden, the Board of Education and CTIO Mike Evans understood the importance of designing classrooms for the future – and the negative impact of holes and gaps in wireless coverage. So they approved the replacement of the existing wireless infrastructure and hardware. To address the demands for a more robust wireless infrastructure, the Technology Services Department now has two Category 6A cable runs in each classroom dedicated to servicing wireless access points, with the pair being logically bonded to provide an aggregate of 2 Gbps to each access point. 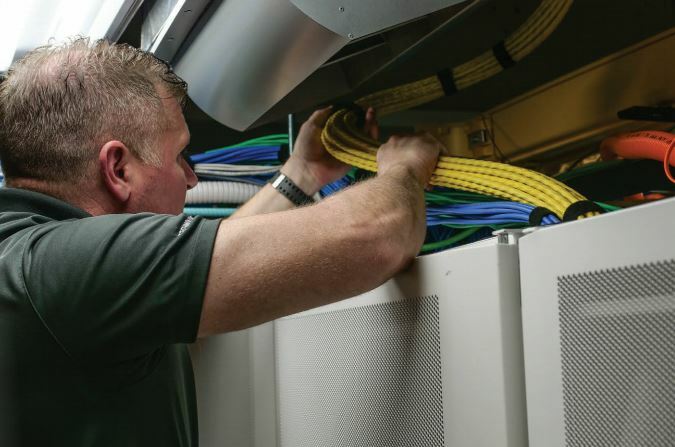 The new REVConnect Connectivity System from Belden, which supports Category 5e through Category 6A shielded and unshielded connections, was used for this school network overhaul to speed up installation, limit rework and retesting, and ensure fewer failures in the field. REVConnect also saves the Technology Services department time by offering an easy way for in-house staff to fix problems as they arise. For example, if a student causes damage by inserting something into a drop that shouldn’t be there, another end can be installed quickly by someone internally – without needing to call and wait on an installer or technician. How is your network infrastructure transforming to meet the influx of devices and technology being used by the people in your organization? Tell us in the comments below! Have questions about what you need to do to make sure your network is ready for the future? Contact us! Next Post Is Your Stadium Ready to Support 5G Capabilities? Since 2015, Alan Halloy has worked with customers in Belden’s southeast region to implement enterprise connectivity solutions that solve their LAN, data center, pro AV and broadcast challenges. His proven track record of helping clients gain greater efficiencies from existing resources makes him a valuable addition to Belden’s team. He has more than 20 years of experience in enterprise cable and connectivity solutions.